If you haven’t taken our 2018 Member and Friend survey, please take 3-5 minutes to give us your opinions! Responses close on Friday, March 16th! The Forest Service has finalized their decision to consent to exploratory drilling in the Green River valley. Currently, the Bureau of Land Management is deciding whether to issue exploratory drilling permits to Ascot Resources. We will continue to challenge these permits through administrative processes and the courts. In forest collaborative groups, diverse stakeholders including environmental organizations, timber companies, recreational organizations, and other interested members of the community come together to discuss timber sales and other proposed projects with Forest Service staff. 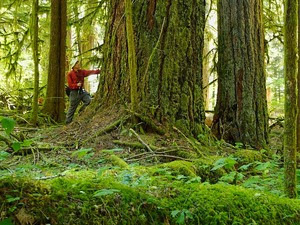 Cascade Forest Conservancy is a founding member of, and active participant in, both forest collaboratives in the Gifford Pinchot National Forest. The Pinchot Partners, formed in 2003, focuses on projects in the Cowlitz Valley Ranger District, and the South Gifford Pinchot Collaborative, formed in 2011, focuses on projects in the Mt. Adams Ranger District. Through collaborative participation, our goal is to influence GPNF projects to be sustainable for wildlife, fish, water quality, and local communities. CFC Friends Featured on OPB! Darryl and Darvel Lloyd were recently featured in an OPB special about their long history of conservation work on Mount Adams. The Lloyd brothers have been great partners of CFC for many years. We are lucky to get to work beside them in studying and helping to protect the unique landscapes of Mount Adams. Click here (https://cascadeforest.org/wp-content/uploads/AnnualReport2017.pdf) to take a look at our 2017 Annual Report, where we describe some of our major accomplishments over the past year. Thank you to all our members and supporters for making our work possible! If you’re an energetic individual who is passionate about the environment, enjoys working outside and meeting new people, we’d like to meet you. The Cascade Forest Conservancy is looking for someone like you to join us as a Membership Outreach Advocate! Channel your passion for the outdoors into action and make a difference with this exciting opportunity!